The Los Angeles Clippers now know when they will get Blake Griffin back from his broken hand and quad injury: April 3. Griffin has been cleared medically but first must serve a four-game suspension because he broke that hand while punching out a member of the team's equipment staff outside a Toronto restaurant earlier this season. The Clippers have played well without Griffin, but anyone who says they are better without him doesn't know basketball. Could the Clips perhaps trade him this offseason if they flame out in the playoffs again? It's possible. The Clips really have nothing to play for the rest of the regular season other than to get Griffin re-integrated. They are going to finish No. 4 in the West and probably host the Grizzlies in the first round. That's a great matchup for the Clippers since the Grizz are without Marc Gasol and might not have Mike Conley back for the postseason. 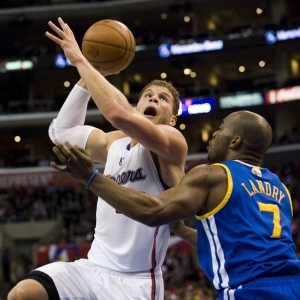 Griffin will have seven regular-season games to get back into game shape. That should be enough time. Chicago hosted Atlanta on Monday; the team aired out some grievances among the players and coaches following a really bad loss in Orlando on Saturday. Something is not right in that locker room. Indiana beat Houston 104-101 on Sunday behind 25 points from Paul George and 23 from Monta Ellis. Chicago leads the season series with Indiana 2-1. Those two wins are by a combined three points. The Bulls lost by 12 in Indianapolis on Nov. 27. Key trends: The Bulls are 1-6 against the spread in the past seven meetings. The "over/under" has gone under in five of the past six meetings. Early lean: TBA because the Bulls have a few banged-up players, but they were all expected to play Monday. Might not do both. Like Indiana by double digits here. Brooklyn was in Miami on Monday. Orlando beat Chicago 111-89 on Saturday to end a six-game losing streak. Dewayne Dedmon had a career-high 18 points and season-high 13 rebounds. The Magic were without leading scorers Nikola Vucevic and Victor Oladipo; both practiced on Monday and Oladipo is at least likely to play here. Orlando looks for the four-game sweep. Brooklyn hasn't topped 93 points in any of the first meetings. And it still had Joe Johnson for all those. Key trends: The Nets are 2-6 ATS in the past eight meetings. The under is 4-1 in Orlando's past five overall. Early lean: Wait on that Magic duo. Charlotte won in Milwaukee 115-91 on Saturday. Nic Batum had 25 points, 23 of those in the first half. That was a career high for any half. Marvin Williams, who has been hampered by an ankle injury, had 21 points. Philly was a 21.5-point dog Sunday at Golden State but covered in a 117-105 defeat, the team's ninth straight loss. It was the second-largest spread in an NBA game in the past 20 seasons, trailing only a 2008 Celtics-matchup in which Boston was -22. Philly big man Nerlens Noel missed his third straight game with a contusion on his right knee. Forward Jerami Grant suffered a right knee injury early and didn't return. Charlotte is 2-0 against Philly this season, winning them by a combined 45 points. Key trends: The road team is 5-2 ATS in the past seven meetings. The over is 5-2 in those seven. Oklahoma City was in Toronto on Monday. Wouldn't totally shock me if Kevin Durant or Russell Westbrook got this game off with OKC pretty much locked into the No. 3 seed in the West. Detroit's five-game winning streak ended in a 112-95 home defeat to Atlanta on Saturday. Andre Drummond had 19 points and 17 rebounds in the loss. The Pistons missed their first seven shots from the field and never recovered. Oklahoma City beat visiting Detroit 103-87 on Nov. 27. Durant had 34 points and 13 rebounds. Westbrook had one of his worst games with 14 points and 11 turnovers while fouling out. Key trends: OKC is 2-5 ATS in the past seven meetings. The over is 7-2 in Detroit's past nine at home. First of a TNT doubleheader and will have live betting at sportsbooks. Houston lost 104-101 in Indiana on Sunday. James Harden had 34 points. The Rockets were just 7-for-33 from long range. Cleveland won in New York 107-93 on Saturday playing without Kyrie Irving, who was simply resting. LeBron James had his third triple-double of the season with 27 points, 11 rebounds and 10 assists. He's about to pass Dominique Wilkins for 12th on the NBA's all-time scoring list. Tristan Thompson will presumably play in his 362nd straight game here, which would set the franchise record. Houston lost at home to Cleveland 91-77 on Jan. 15. Irving had 23 points and LeBron 19. The Cavs held the Rockets to a season low in points with just 11 points from Harden on 2-for-10 shooting. Houston had won the previous six meetings. Key trends: Houston is 2-5 ATS in its past seven in Cleveland. The over is 4-1 in the Cavs' past five overall. Early lean: Reportedly James will get the night off. Might some other Cavs too? Houston pulls the upset. Second TNT game with live betting. Washington started a five-game West Coast trip with a 101-88 victory at the Lakers on Sunday. John Wall had 22 points and 13 assists. Monitor Bradley Beal's status here as he took a fall in the first half and had just four points. Markieff Morris missed the game with a strained right calf and is questionable. Golden State won its fourth in a row Sunday, 117-105 against Philadelphia. Klay Thompson had 40 points, his second straight with that many, and Draymond Green his 12th triple-double of the season. It was the Warriors' 53rd straight home win. They joined the 1995-96 and 1996-97 Bulls as the only teams to win at least 66 games in consecutive seasons. The Warriors need to go only 7-2 the rest of the way to set the single-season wins record. These two played a fun game on Feb. 3 in D.C., a 134-121 Warriors win. I remember thinking the Wizards had a chance for the upset then, but Curry went off for 51 points, tying Gilbert Arenas and Michael Jordan for the Verizon Center record. Wall was no slouch, hitting 17-for-25 for 41 points while adding 10 assists. Key trends: The Wizards are 1-5 ATS in the past six meetings. The over is 5-1 in Washington's past six road games vs. teams with a winning home record. Get free picks from any Doc's Sports handicapper - there is no obligation for this offer and no credit card required. Just sign up for an account, and you can use the $60 in free picks for any Doc's Sports Advisory Board handicapper and any sport. Click here to get started now.